Aunt Cybby Ran at Lone Star, Retama and Sam Houston before coming to Canada to run for our friend Ross Brigden. 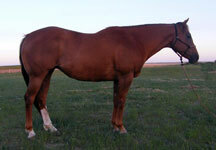 This mare ran successfully at the track for 4 years, a true testament to her structure, soundness and HEART! She had 21 starts in total and a best speed index of 101. Aunt Cybby’s dam Cymbidiam Si 104, ran successfully at distances from 300 up to 870 yards. She had 19 starts, 5 wins, a second and 5 3rds. This mare has what we feel so many performance bred horses of today lack: bone, foot, great carry-down, and that overall made-to-last but still-really-fast appearance of the good old-time racehorse!